The Risi Papas Caseras range features a somewhat out of place tiny logo in the corner. But mostly, in fact it is shouted so loudly on the front that you are left in no doubt: THESE ARE KETTLE CHIPS and if you don't get that first time, we will shout it again in a second language! It is not really necessary. The flavors are color coded and there is an image of whichever scary pepper is included within the flavor. The whole effect is a little mundane, but the bag design is bright, colorful and modern. The seasoning may have dampened down these Chips a little. The oily, brittle crack that you often find with Kettle Cooked Chips was dimmed by an almost food like break. The crunch was however sustained till the end when the Chips mushed away while gasping for their last breath of life. Adobo sauce is a marinade or stock that in Chip parlance, would probably stick to the surface of the skinny potato slices. And they certainly did in this case. The Chips were thick and curly. There were also some oily areas. There was skin on edges. But mostly, there was a bright red seasoning glowing at us. These Chips looked interesting straight out of the bag. 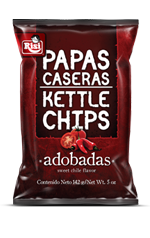 These are Sweet Chile Chips. Or Chips with an Adobo sauce flavoring. Adobo is a marinade that is often made from paprika, oregano, salt, garlic, and vinegar. That's pretty much what these Chips tasted of, but then we were looking for it after reading the ingredients list. We were so excited by the color of the Chips that they could have tasted of tree bark and we would have nodded in agreement. These Chips had an almost hypnotic power. We were going to like them whatever. The smoky tomato powder was throat drying and spicy. There was a good heat, but not one that overwhelmed a really enjoyable spicy flavor mix.